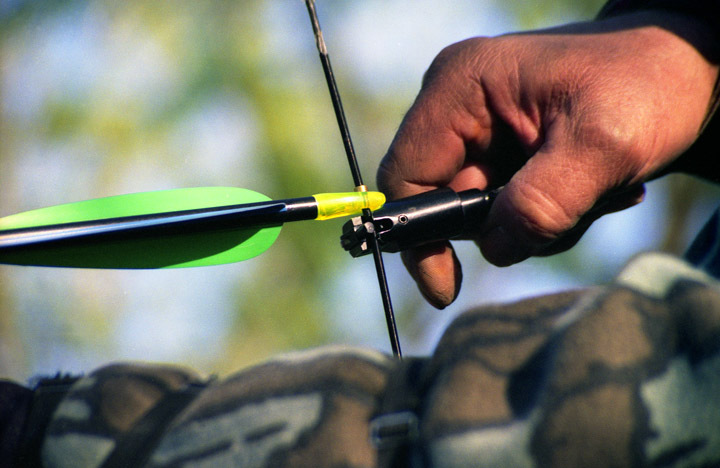 For the author, bowhunting is 75% practice, 25% hunting. In the field, he shoots from the sitting position. Thus he regularly practices shooting while on a stool, firing from all angles and elevations. 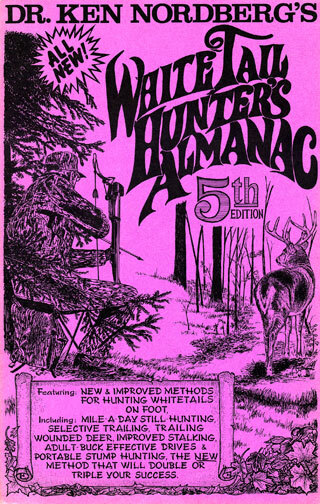 At any rate, this issue and next, I'm going to attempt to outline the basics to become a successful bowhunter. We'll start with choosing archery gear and learning to maintain and shoot it well. In April, we'll cover suggested clothing and then provide a step-by-step approach to locating game and stand sites, preparing those stand sites and using some proven hunting techniques. I'd encourage you to save both these articles for your won review or to pass on to a friend interested in taking up the sport. As near as I can figure, archery made its first bold move from the Stone Age around 1961, the year I bought my first hunting bow and a dozen cedar-shafted arrows (only one length available). I found this bow stashed in a dusty back corner of a gun shop. The proprietor knew little about it except, "It's one of those newfangled recurves, a short, so-called 'brush bow' (discovered to mean, it stacks like crazy). Those recurved limbs are supposed to make an arrow fly faster." With my new bow in hand, I joined an archery club (only one member hunted deer) and learned to shoot instinctively (no sights available back then). I was considered "a pretty good shot" when I could finally hit a dinner plate-sized target almost every time. So, I smeared my face with burnt cork (camo paste not yet invented) and took to the field in quest of whitetails, hunting them from ground-level blinds (portable tree stands not yet discovered). The big changes began in the early 1970's. Portable tree stands were introduced as an engineering marvel, while the new compound bow was said by some to be as deadly and accurate as a big game rifle. 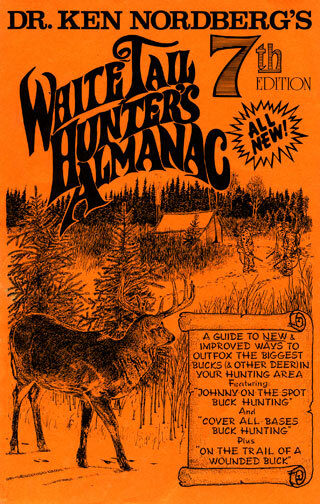 Along with those came a bewildering array of archery shooting aids, clothing and buck lures that began to crowd sporting goods shelves everywhere, not only increasing success of this ancient sport, but its popularity as well. 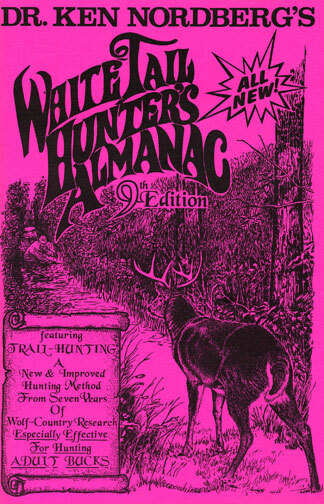 During this same period, whitetails rapidly adapted to and successfully countered each new advantage developed by hunters. "The first thing you must realize," I usually tell the beginner, "to be successful at bowhunting, you must become an exceptional hunter, very knowledgeable and very skilled in every aspect of the sport. There is no middle ground. You cannot often succeed, if at all, if you depend on luck using randomly selected stand sites and hoping for chance encounters. Unlike firearm hunting, your quarry must be unsuspecting, standing or moving slowly at very short range, generally within 30 yards." Doc takes aim at a nice whitetail buck with his bow. "It takes plenty of whitetail savvy to put yourself within 30 yards of unsuspecting whitetails. You must be very cool under pressure, able to shoot accurately at deer that have been near you over long periods of time. Whatever you do, you cannot allow yourself to cause unnecessary suffering among whitetails or jeopardize the future of bowhunting by being a poor shot. Everything you do must be directed toward allowing yourself to make perfect shots every time — humane, quick-kill, no-waste shots." 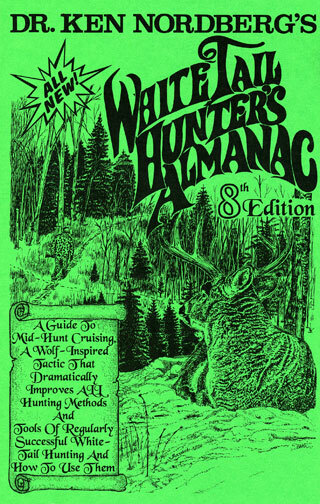 "Now then," I generally add, "if it is truly your intention to become this kind of hunter, I'd be more than happy to take the time to start you down the road toward successful bowhunting." Close-up of Doc using his mechanical release. The selection of bowhunting equipment is a highly individual part of bowhunting. My six bowhunting partners and I shoot with equal accuracy on the practice range and use the same hunting methods. But, while standing together afield, we appear to originate from different planets. 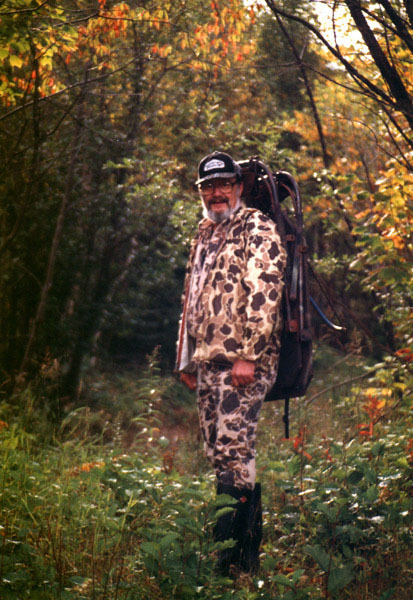 No two of use the same bows, camouflage clothing and other hunting gear. When my sons and daughters began shopping for their first compound hunting bows, they all thought they'd purchase a bow like mine, a proven Oneida Eagle. I advised them, however, to shop at archery shops where they would have the opportunity to try out a variety of bows. "Don't think price alone," I cautioned them. "Pick one that fits." 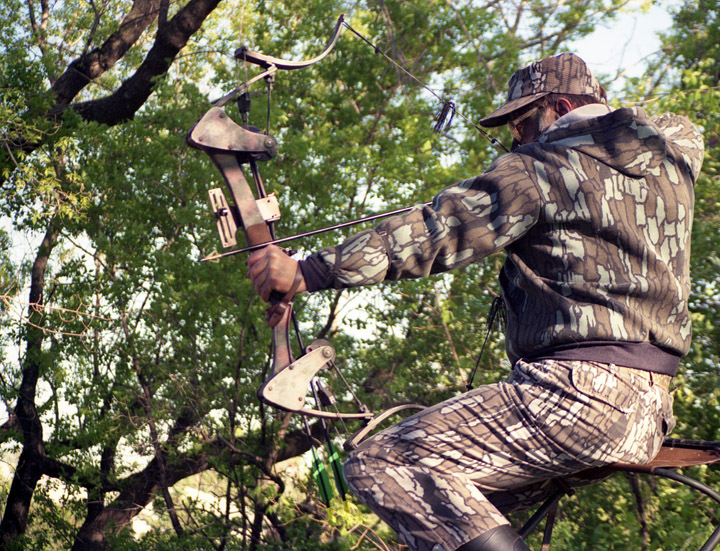 Fit is enormously important to bowhunting success. 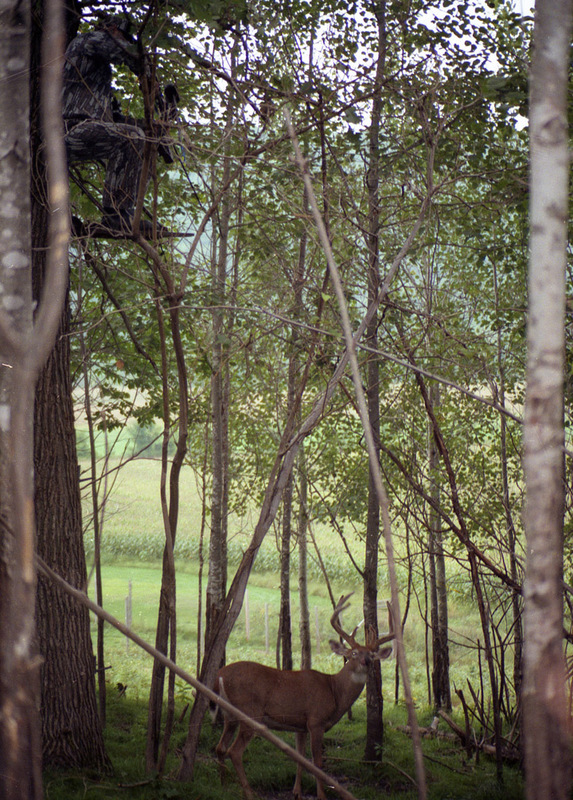 When a real live whitetail suddenly materializes within bow range, especially one with large antlers, your though process will short circuit. It's quite normal, so expect it and prepare for it. From that moment on, your ability to fire an arrow accurately will depend almost wholly on ingrained instincts, a shooting groove developed via long practice. At that point you cannot be forced to make conscious physical allowances or adjustments because your bow doesn't fit. Selecting a proper bow is like selecting proper golf clubs. Each of us is different physically. Our arms, chest and neck vary in configuration and length, and the muscles we use to shoot a bow vary in strength. Today, there are many fine hunting bows to choose from and plenty of fine archery shops with indoor ranges manned by professional archers ready to help you decide which bow suits you best. Your new bow will not come equipped with several essential parts: an arrowrest, nocking beads (one or two), sights, string silencers, and, in the case of an Oneida bow, brush buttons. The arrowrest is the part your arrow slides across as it is launched from your bow. Experience has taught me this is the most delicate part of the bow — the part most likely to be knocked out of position, ruining accuracy. Therefore, it pays to purchase the best and most rugged arrowrest available. In outfitting your bow, your archery dealer will attach one or two beads to your bow string, enabling you to nock arrows (attach to string) at the same precise spot every time you shoot. Sights, like bows, are largely a matter of personal preference. Most bows are equipped with a vertical arrangement of beads, each sighted for shooting accuracy at various ranges. Because my bow shoots flat out to twenty yards and because I will never fire at a quarry more than twenty yards away (to insure complete arrow penetration), my bow is equipped with a single pin, meaning I never have to guess yardage or decide which pin to use. My bow is also equipped with a string peep sight, a rubber ring secured between strands of my bow string. At full draw, I center my bead in the exact center of the peep aperture while holding the bead exactly where I want my arrow to hit. This combination of peap and bead insures I will hold my bow (at full draw) in exactly the same position every time, giving me optimal accuracy. Once your bow is tuned, this least expensive of bow accessories will enable you to shoot like a pro almost from the outset. String silencers, fuzzy or rubbery wads added to your bow string above and below your central nocking point, keep your string from twanging at arrow release. Sound travels faster than an arrow. Typically, if your string twangs, your quarry will spring away before your arrow reaches it. To keep this from happening, add string silencers. Before you can shoot your new bow, you'll need two additional accessories: a finger tab, shooting glove or mechanical release; and an arm guard. Generally, it is not a good idea to draw and release your bow string with bare fingers. Aside from being hard on skin, the string is likely to be moved laterally as it slips from your fingers, affecting accuracy. I personally prefer using a mechanical release, which insures the string will be released the same way with every shot, enhancing accuracy. My release is attached to my wrist via a Velcro-covered leather band, meaning only the strongest muscles of my arm are being used to draw my bow. The advantage becomes especially apparent when I must hold a full draw for an extended period of time while waiting for a deer to move out from behind intervening cover. The string of my bow has never struck my left forearm or wrist at arrow release. If it did, it would doubtlessly remove skin. This is the primary reason bowhunters wear arm guards. Most often, my arm guard simple serves to keep loose-fitting sleeves from getting in the way of my bow string. Though not essential, I would recommend you also outfit your bow with an arrow holder, a device that keeps a nocked arrow firmly where it should be to fire an arrow — on or very near your arrowrest. Some arrowrests also act as arrow holders. When a whitetail suddenly appears at short range, an arrow holder helps minimize movements necessary to prepare for the shot. In time you'll learn to appreciate anything that aids in reducing movements while whitetails are within bow range. If you are not an experienced archer, start with your bow set at a draw weight of 45 pounds. (Your archery pro will set it for you.) As your shooting muscles strengthen, gradually increase your draw weight (if you can). Sixty pounds is optimal, I believe, for hunting whitetails and black bears. Arrow selection comes next. Based on the length of your draw, your draw weight and specifications recommended by your bow's manufacturer, your arrows must be of proper length, weight and stiffness. Your archery pro will help you make the proper selection. Many archery shops have charts or computers that will provide you with a selection of arrows to choose from that best suits your bow. After spending a sobering amount of money on a compound bow, don't use inexpensive arrows. Inevitably, all aluminum are bent, most often as a result of being improperly drawn from targets. A mere two-millimeter bend will cause erratic arrow flight, frustrating attempts to adjust sights and develop acceptable shooting accuracy. Generally, higher-priced arrows are stronger, less prone to take a bend and less expensive over the long run. Deer camp discussions concerning what should go on either end of a camo-painted hunting arrow can last all through the night. If you are unsure what to use, begin with whatever an archery shop pro recommends. Like me, in time you'll probably settle on something different. I'm not about to insist what I use is best, but I think it is worthwhile to explain why I use what I use. Some years ago, I discovered bucks and black bears within 20 yards can hear a metal-shafted arrow being drawn across an arrowrest. To eliminate this potentially ruinous sound, I padded my rest and the tip of my plunger with moleskin. Shortly thereafter, I discovered moleskin and fletching (feathers) are not compatible, ripping one another during arrow release. Not only did this cause erratic arrow flight, but substantially reduced arrow velocity. When I shoot a deer or bear, I want my arrow to pass entirely through the animal. An exit wound in the chest cavity guarantees an easy-to-follow blood trail, in turn guaranteeing I will never fail to recover a shot quarry. Therefore, I want no loss of velocity, much less accuracy. Plastic vanes, as I happily discovered, pass across moleskin without noticeable wear or loss of accuracy or velocity. Also, plastic vanes are unaffected by rain, and arrow flight under any circumstances is relatively silent. Down-range, a feathered arrow coming off of an untuned bow can sound like an approaching buzz-bomb, doubtlessly contributing to so-called, "jumping the string" (the quarry jumping the moment the arrow is released). Thus, I prefer plastic vanes over feather fletching. 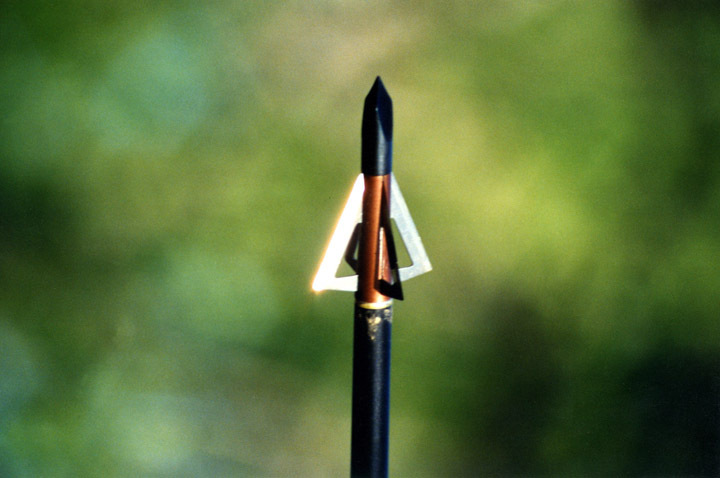 This is an example of one of Doc's broadheads. My personal preference for broadheads evolved along similar lines. Initially, I used expensive 150-grain, three-blade broadheads recommended by an archery shop pro. 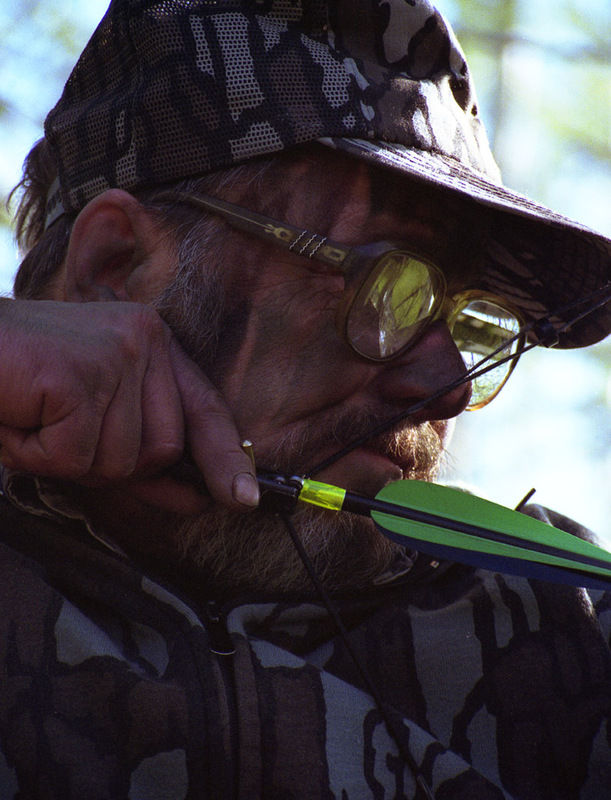 Some years later, a hunter in Illinois showed me some slow-motion videos that proved my three-blade broadhead planed (veered) considerably in crosswinds while the four-blade broadhead he used didn't. So I switched to less-expensive 150-grain, four-blade broadheads. Shortly thereafter, my 150-grain broadhead failed to penetrate all the way through the chest of a 500-pound bear. To reduce resistance (within a quarry), I went to 125-grain four-blade. Using the same draw weight at the same range, my 125-grain broadhead slipped nicely through the chest of another 500-pound bear. Moreover, this heart-shot bruin crashed to the ground only 14 yards away — the most devastating bow shot I've ever seen. Though every hunter in my gang prefers something different, I won't switch from my 125-grain, four-blade broadheads. To safely and silently carry razor-sharp, broadhead-tipped arrows afield, you'll also need some kind of a quiver. There are quivers that strap to your back or belt, but the handiest quivers for hunting are those that attach to your bow. A quiver that firmly holds six arrows should be sufficient. Tuning is the process of adjusting your arrowrest and nocking bead so arrows will be launched without wobbling up and down or side to side, and encompasses adjusting your sights so your arrows will strike where they're aimed. No-wobble releases are important for two reasons: 1) straight flight maximizes arrow velocity, accuracy and penetration and 2) straight-flying arrows are relatively silent in flight, reducing the likelihood of pre-hit responses by quarries. Lacking space, I cannot explain how to tune your bow. It's too complicated. However, if you purchase your bow at a good archery shop, an archery pro will not only properly tune your bow for you, but he or she will teach you how to properly shoot and adjust your sights. Step 3 is to develop acceptable shooting skills. When hunting bows are properly equipped and tuned, most first-time archers will begin hitting bull's-eyes at ranges of 20–30 yards very quickly. Today's archery equipment is that good. 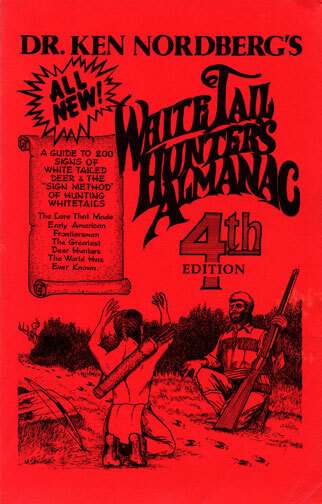 On one hand this is great because it means almost anyone can achieve the marksmanship necessary to successfully hunt white-tailed deer. On the other hand, it's not so great. Like too many firearm hunters, too many beginning archers believe they are accurate enough to take on whitetails after only one or two sessions at a shooting range. Whether using a gun or bow, the problem of the inescapable effects of surging adrenaline makes the average hunter at least four times less accurate when firing at a live than when firing at a paper target. The hunter who has difficulty keeping all shots within a 10-inch circle on a paper target will have a devil of a time hitting any part of a deer at a comparable range. Firearm hunters often take deer hit poorly because today's fast-moving big game cartridges do so much damage to tissues well beyond the path taken by the bullet. Moreover, big game bullets readily penetrate through large bones. Arrows only cause damage to tissues directly in their paths, and though they readily penetrate through ribs, they are unlikely to pass through large shoulder and leg bones surrounding the ribs. For this reason, arrows are unlikely to effect a quick and humane kill unless they miss large bones and pass through tissues especially vital to life, mainly lungs and/or heart. The average whitetail's lungs measure ten inches from top to bottom and front to back; the average whitetail's heart measures three inches from top to bottom and 4–5 inches from front to back. 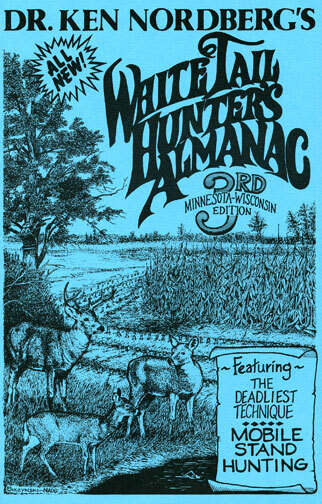 This means the bowhunter is not ready to hit whitetails in lungs until he or she can put every arrow, including the most difficult first shot of the day, into a 2.5-inch circle on a paper target at ranges of 10–30 yards (while sitting or standing); not ready to hit whitetails in hearts until he or she can put every arrow into a 1.5 inch circle at those ranges (while sitting or standing). This means if you cannot shoot with such accuracy at ranges beyond 15–20 yards, you should never fire an arrow at a deer more than 15–20 yards away. Next issue we'll explain the need for specialized clothing, then send you out to scout and prepare stand sites well in advance of the season opener. We'll also share proven hunting techniques. Till then, keep practicing!